This little story comes to you from a post I made this morning on my Facebook page. I hope you enjoy! 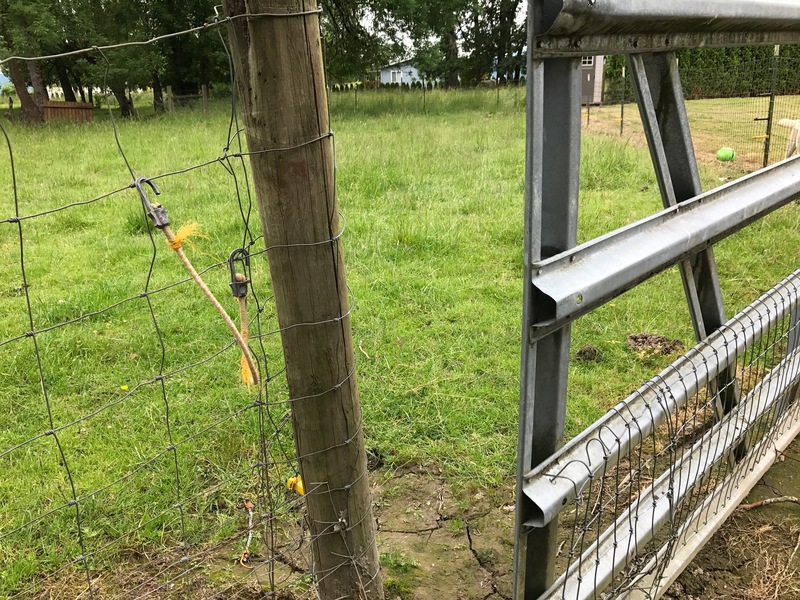 Today’s adventures include an odd-looking four-legged creature standing stock-still in the driveway of my friends’ house when I went outside to take the trash out, and an even stranger sight – the pasture gate… standing wide open. 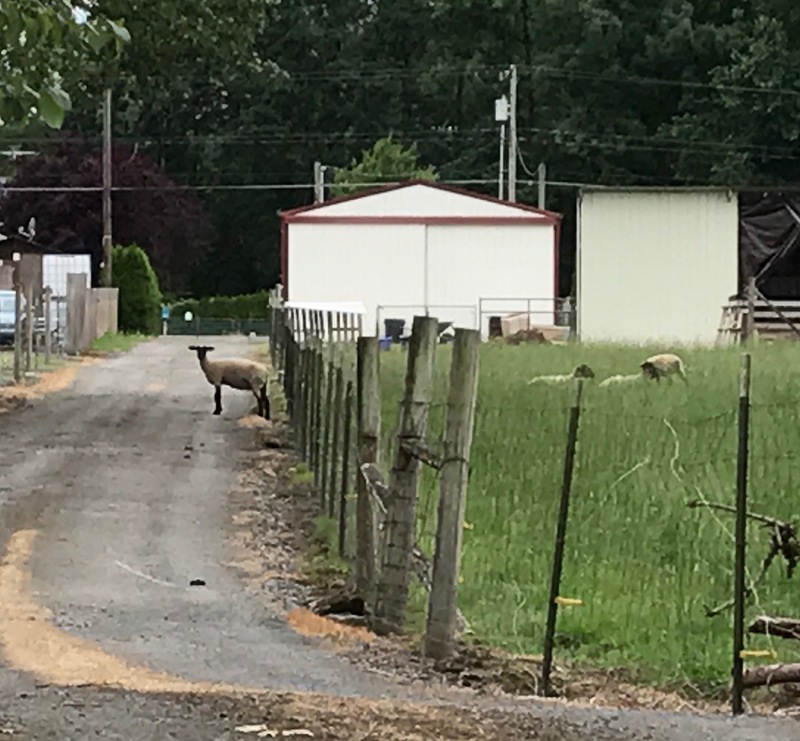 That’s a sheep standing in the driveway, motionless, on the other side of the fence from the rest of the sheep who are lying down in the pasture near the wayward sheep (see their heads poking up above the grass to the right of the sheep posing in the driveway?). Thank goodness it was only one sheep standing there and not all five of the sheep that are normally in the pasture. Thank goodness the other four sheep didn’t follow the one renegade sheep out through the aforementioned open gate – I don’t know that I could have wrangled all 5 of them back into their pasture on my own. 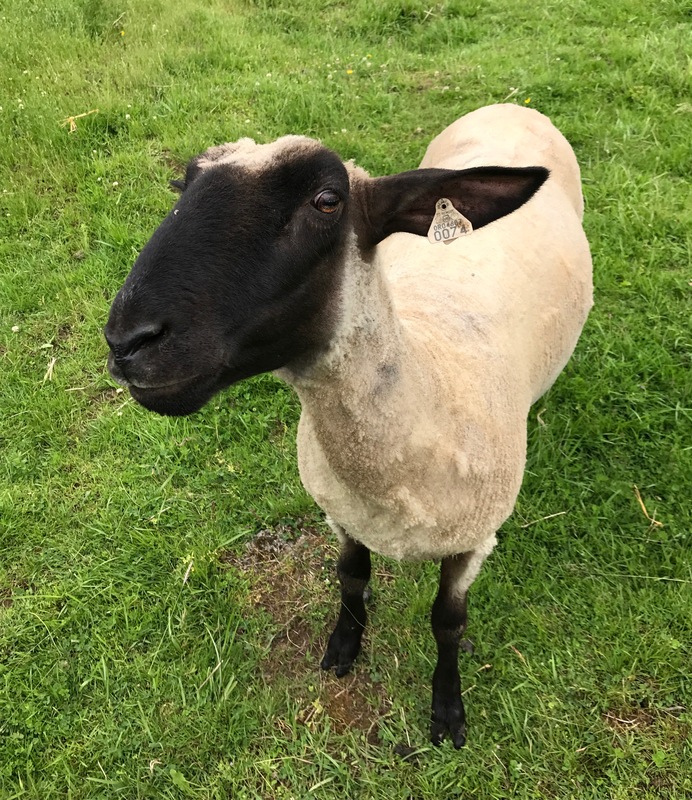 As it was, I was already somewhat concerned that the one loose sheep would start running down the driveway away from me as I was trying to figure out if she belonged here on this property, or if she was a refugee from someone else’s property nearby. If she did decide to head away from me, she would end up out into the street where she could get hit by a passing truck. That would be one big, huge Ugh. While she was out on the lamb, I mean lam (haha! ), Martha the Sheep got into the barn and helped herself to the big bowl of ducks’ food that belonged to Louie the Duck and his harem of three Indian Runner Duck girls, and then she rearranged the two rabbit cages (knocking one of them off its supports onto the ground, poor bunny), munching on some of their food and spilling the rest of it on the floor. That runaway wool-grower seems to have had quite the single-sheep party going on out there in the barn all by her lonesome. Gosh darn it… I was going to be spoiling all her fun by corralling her back into the pasture. Oh well. Such is the life of a sheep, I guess. And you know what? She’ll never be the same, that escape artist of a sheep. I’m sure that once a sheep has had a taste of freedom, there’ll always a niggling little voice in the back of her tiny pea-brain that whispers “Go for it! You can get outside the pasture! Freedom! Let it ring! Go get that duck food… you know it tastes oh so yummy!” Poor Martha. Once a Free Sheep, now just a member of the Fenced Flock again. Of course, she’ll always have her memories… delicious dishes of duck food, no restricting fences surrounding her, tasty morsels of forbidden rabbit pellets, no one and nobody to tell her what to do. Yup, poor, poor Martha. Now who left that danged gate open? It sure didn’t hook that bungee-cord-closer onto the adjacent fence all by itself. Or did it? Or did the sheep do it? Sheep with hooves that work like opposable thumbs? Now that would truly be something to see! ← Plan B – There’s Always a Plan B, Isn’t There? Hahaha! Love the treasured moments you share with us. lose the cord. get a wire or light chain. sheep are like goats they mouth things. if they get loose get same treat food and slowly lead them where you want them. if you need help ask neighbors. they will be over if they have an emergence. go to see your life has gone to sheep. good not go. what can i say? What a hoot! Thanks for making me laugh….